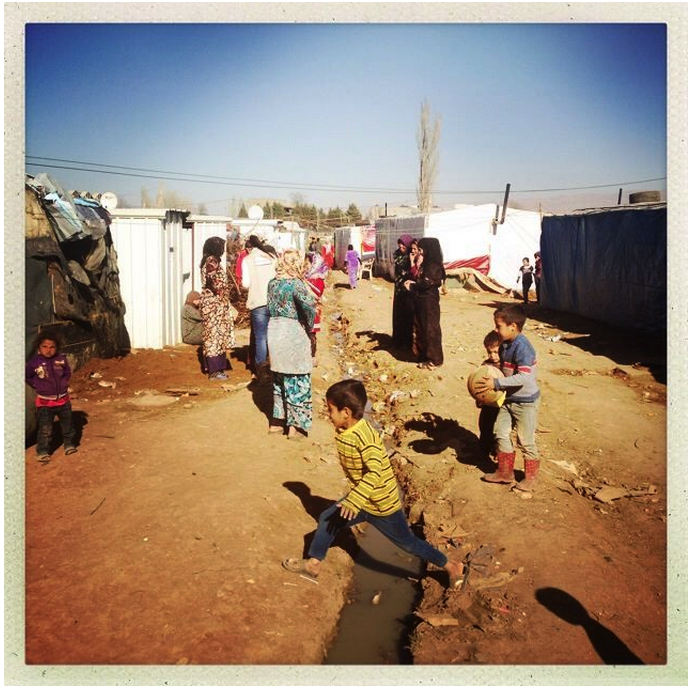 “A Syrious Story” by Albert Thoumy – A day in the Syrian refugee camps of Lebanon. “I know a little about plants and cats and dogs, but i don’t understand humanity”. We might not wanna keep count of the deaths and amount of destruction behind the border but we do see and feel the refugees’ presence around us. And while many of us resent foreign occupation, especially those claimed “temporary”, we must be stupid to think this is not our problem. For they exist, in bold numbers. No part of the country is absent of Syrian presence. Some are managing to blend in. Hundreds of thousands are surviving in temporary camps. On my way to the Bekaa for a site visit, my new friend from World Vision, an international NGO with established programs in Lebanon since 1975, explains to me the scope of relief work they are implementing. We talk about human dignity and not having to wait in line, every month, for days and hours, in the hope of receiving food. And so the NGO recently upgraded distribution procedures by issuing registered Syrian families with credit cards funded by the World Food Programme, through which monthly $31 are transferred for basic nutrition, along with a list of audited local shops to do business with. Another UNHCR credit card with cash monthly allocations during winter was also offered, with a $550 budget per card settled over 5 months. I’m impressed with the logistical complexity of the international support network. Aid also includes blankets, hygiene kits and babies’ diapers. We get to a quiet public school, turned into a distribution facility that has been buzzing with fainting crowds just a few weeks ago but became a calm gathering point for refugees requiring additional support. We attend a training session where a volunteer briefs a mostly middle-aged female attendance on how to use the credit cards and manage the tight budget. The scholars follow explanations religiously. Outside again, we’re noticed by a few men and immediately surrounded. They ask for help: “the program excluded my family”, “we’re not entitled to the same support as others”, “can you enroll us in the program?”. The crisis has been going on for a while and funding is diminishing. There are so many people in dire need for food and shelter, yet not enough resources to help everybody. Some of these people lived much more comfortably in their Syrian towns. And some struggled with minimum dignity. But their stories are all identical: destruction, escape, survival. I’m not sure i’m ready to hear so many bad news in so little time. And i know many of us don’t want to hear it at all. Our next stop is a small piece of land sheltering around 100 families. WV has also been supporting this camp with bathroom stalls and water tanks to each family. The politically-correct word is Informal Tent Settlement. Jargon is psychological; we don’t like to hear the word “camp” either. We are greeted by a nauseous smell of sewage and a smiling man. The “shawish” as they call him, or the sheriff had we been in the Wild West, welcomes us in and follows us through the tight streets in-between the tents. Cubicles, i would think. It doesn’t matter: it’s all they have or can afford. First thing that catches my eye, is the number of children around us. They started gathering when we parked the car and their number has been exponentially growing with every step we took. Second thing, is the colorful atmosphere. Tents are mostly white, covered with the verso of advertising banners gathered from here and there. Many have poured a concrete floor and built some walls with stacks of stone bricks to hold the banners. But the monotone aspect of the tents is contrasted by the women in ablaze and vivid fabrics, adorned with un-precious stones and worthless jewelry. Some even display smiles. In spite of all the sadness that surrounds us. They stand in groups, at the entrance of each neighborhood within the ethnic community. We are invited inside many homes and served coffee in make-believe tea gardens. There are jokes. Witty remarks. And more bad news. “Are you registered?” asks my friend referring to the UN refugee procedure of keeping count and track of all visitors, facilitating help. Negative answers are common. The registered amount of refugees is close to 1 million in Lebanon. Hundreds of thousands refrained from doing so, initially fearing some political consequence. Now many are unable to enroll and fight to get heard. The worst part, is that those are the privileged refugees. Those who could manage to get an ITS in the first place. They are relatively protected of the cold, living in clean open-air with access to fresh water and sanitary. Not envious of refugees-in-hiding who settle in insalubrious habitations. I meet widows, orphans, handicapped and some recomposed stepfamilies. Every family has a martyr. And despite the losses, a common denominator in every refugee community, mourning is something they will deal with at a later stage. Or at least in privacy. For now, they focus on survival. In addition to the administrative headaches, they talk about their inability to find proper work or means of living, the bullying and rejection they face everyday, and most of all, the lack of prospect for a better tomorrow. Leaving is the worst part because they doubt your credibility to make a change. After all, they’ve met deception first hand. I personally shut my mouth most of time and offered my ears. But they are only a fraction of the problem and NGOs are doing their best. Final stop is a public school in which a Fast Learning Program for Syrian children is in place also under WV expertise, as children well-being is their top priority, with UNICEF funding. In psycho-social class, i sit with children expressing the bullying they experience on a daily basis through improvised acting. I then take a hygiene class. There’s a math session going on that i avoid on purpose. Before we leave, the kids offer us an acapella performance of “nassam 3aleyna al hawa”. They dramatically stress the “khedni 3ala bladi” part. A jigsaw puzzle of parameters affect the lives of the people i met today. Their fate is tied to an ongoing diplomatic nightmare. To simplify: is Lebanon able to host so many refugees in crisis situation? With proper help, absolutely yes. They’re here after all. Are we OK with their presence? Or better yet, are the refugees happy with it? I know a little about plants and cats and dogs, but i don’t understand humanity. Especially the shorted-sighted opinionated part of it. But i know for a fact that desperate men and women act in desperate ways. And i’d better medicate the sick to avoid health threat outbreaks. And also for my own well-being, i’d sure rather see those children schooled than left on the streets.